The exhibition will feature landmark series by the artist – Ard El Lewa series (2015-16), South South (2016) and Only Dreamers Leave (2016-2017) – that will later be exhibited at the 13th edition of Dakar Bienniale of Contemporary African Art. 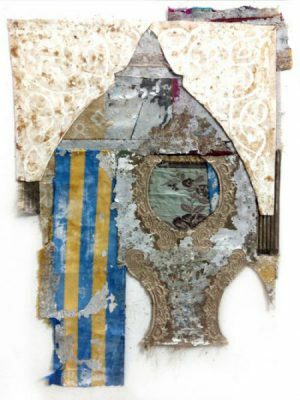 Ard El Lewa, a series that takes it’s name from the Cairo neighbourhood in which the artist lives and works, is a body of work which creates mixed media assemblage pieces. Fragments of textiles are painted with acrylic wall paint, and finally distressed and faded. Visually quoting tapestry traditions found across the Silk road countries and beyond, these works explore themes such as transnational identity, migration and borderlessness. Ard El Lewa is a collection of works about ambiguity, in-betweeness, and the fallacy of authenticity as a governing concept for identity construction. Following up on Ard El Lewa is the series South South, which explores a subject-matter that utilizes Cairo’s most common construction material, bricks. Each brick is comprised of approximately 100 layers of textiles from around the world, specifically the global south. Each unique piece is created through a productiom process that involves local laborers as well as refugees in Ard El Lewa, thus the works emerge from the area’s south-south cosmopolitanism, national uncertainty and marginality both in terms of social class and national belonging. Each sculpture holds its own aesthetic characteristics revealing different pieces of the many components that create its solidity, yet presented together, the work displays commonalities and similarities as they are formed from the same strands. Fragments of numerous cultures create seemingly individual units with more in common than meets the eye. Lastly, the latest installation by the artist entitled Only Dreamers Leave (2016-2017) is an installation of sails fabricated from heavy and porous textiles associated with labor and domestic work. Embroidered on the fabrics are gold patterns referencing baroque and arabesque iron gates, symbols of wealth and status in Egypt that dually function as exclusionary barriers. Weighted to the ground and congesting the space, the sails create an obstruction to the visitor’s path through the installation. These stagnant metaphors of mobility rewrite the narrative of the immigrant dream to include the reality of global systems of exclusion and segregation that are impossible to leave. Along Those Lines is a show that displays Ahmed’s recent works that have long since mined the in-between spaces of belonging, one not defined by geography or heritage. In his complex works, Ahmed attempts to draw parallels between theoretical constructs of postcolonial discourse—themes of fluidity, oppression, heterogeneity, flux—and aesthetic visualization.